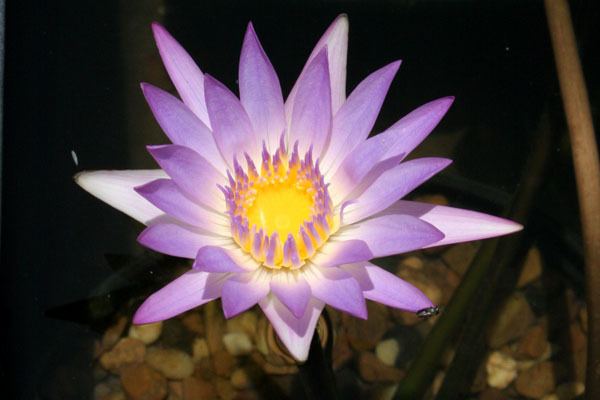 This beautiful Tropical Water lily was named after Ganna Walska (born Hanna Puacz on June 26, 1887 – March 2, 1984) was a Polish opera singer and garden enthusiast. She was married six times, four times to very wealthy husbands. The lavish promotion of her lackluster opera career by her fourth husband, Harold Fowler McCormick, inspired aspects of the screenplay for Citizen Kane. Madame Ganna Walska has large, stunning light pinky purple flowers with yellow centers have dark green leaves with red blotches. This plant can spread up to 72″ and is recommended to be in 12-30″ of water in a 2-gallon or larger container. It is one of the most prolific of the viviparous water lilies. An exotic violet-pink colored day blooming tropical water lily. It is easy to grow, adapts fairly well to shade, and is a prolific bloomer. Call (818) 353-5131 for availability! Rises far above the water’s surface to grand effect. A great addition to any size pond.